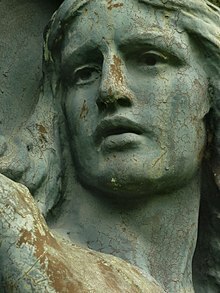 The Glasgow Necropolis is a Victorian cemetery in Glasgow, Scotland. It is on a low but very prominent hill to the east of Glasgow Cathedral (St. Mungo's Cathedral). Fifty thousand individuals have been buried here. Typically for the period only a small percentage are named on monuments and not every grave has a stone. Approximately 3500 monuments exist here. Following the creation of Père Lachaise Cemetery in Paris a wave of pressure began for cemeteries in Britain. This required a change in the law to allow burial for profit. Previously the parish church held responsibility for burying the dead but there was a growing need to give an alternative solution. Glasgow was one of the first to join this campaign, having a growing population, with fewer and fewer attending church. 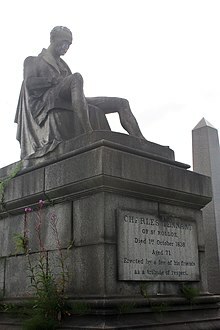 The planning of the cemetery began formally by the Merchants' House of Glasgow in 1831, in anticipation of a change in the law. The Cemeteries Act was passed in 1832 and the floodgates opened. Glasgow Necropolis officially opened in April 1833. Just prior to this, in September 1832 a Jewish burial ground had been established in the north-west section of the land. This small area was declared "full" in 1851. Predating the cemetery, the statue of John Knox sitting on a column at the top of the hill, dates from 1825. 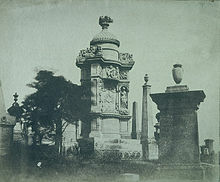 Alexander Thomson designed a number of its tombs, and John Bryce and David Hamilton designed other architecture for the grounds. The main entrance is approached by a bridge over what was then the Molendinar Burn. The bridge, which was designed by David Hamilton was completed in 1836. It became known as the "Bridge of Sighs" because it was part of the route of funeral processions (the name is an allusion to the Bridge of Sighs in Venice). The ornate gates (by both David and James Hamilton) were erected in 1838, restricting access onto the bridge. Three modern memorials lie between the gates and the bridge: a memorial to still-born children; a memorial to the Korean War; and a memorial to Glaswegian recipients of the Victoria Cross. Across the bridge the original scheme was to enter the area via a tunnel but this proved unviable. The ornate entrance of 1836 remains. The cemetery, as most early Victorian cemeteries, is laid out as an informal park, lacking the formal grid layouts of later cemeteries. This layout is further enhanced by the complex topography. The cemetery's paths meander uphill towards the summit, where many of the larger monuments stand, clustered around the John Knox Monument. 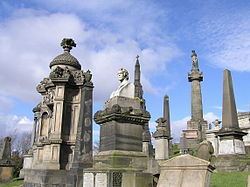 The Glasgow Necropolis was described by James Stevens Curl as "literally a city of the dead". Glasgow native Billy Connolly has said: "Glasgow's a bit like Nashville, Tennessee: it doesn't care much for the living, but it really looks after the dead." Glasgow Necropolis holds graves of 19 Commonwealth service personnel, 15 from World War I and 4 from World War II, that are registered and maintained by the Commonwealth War Graves Commission. The first, and highest ranking, of those buried here is Lieutenant-General Sir James Moncrieff Grierson, who died in August 1914 in France and whose body was repatriated. His grave is in section Primus 38. ^ "Results". www.cwgc.org. Retrieved 27 February 2018. ^  CWGC Debt of Honour Register.